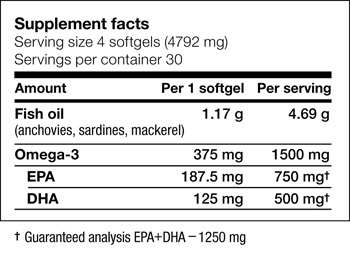 Are NutraSea softgels “enteric coated”? No. 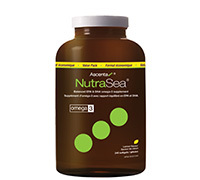 NutraSea softgels are not enteric coated. They are therefore broken down in the stomach where the first stage of fat digestion occurs. Some fish oil companies use an enteric coating, which prevents the softgels or capsules from breaking down in the stomach. The only need to use an enteric coating is to reduce the fishy reflux associated with lesser quality fish oils. Because NutraSea is far more stable and does not have a fishy taste or smell it does not require an enteric coating. Ingredients: fish oil (anchovies, sardines, and/or mackerel), all natural flavouring, natural tocopherols (derived from non-GMO soy), green tea extract. Softgel ingredients: Â gelatin, glycerin, purified water. Directions: Adults 19 years and older takeÂ 4 softgelsÂ daily.